According to Amazon.com the much anticipated C++Builder Developer's Guide is now shipping!! I have written six C++Builder 6 chapters (on dbExpress, BizSnap, XML Document Programming, SOAP & Web Services, DataSnap, and WebSnap - 162 pages in total) and can assure you that the book will be worth the wait. You can now order C++Builder Developer's Guide from Amazon.com (with a 30% discount) and also from Amazon.co.uk. 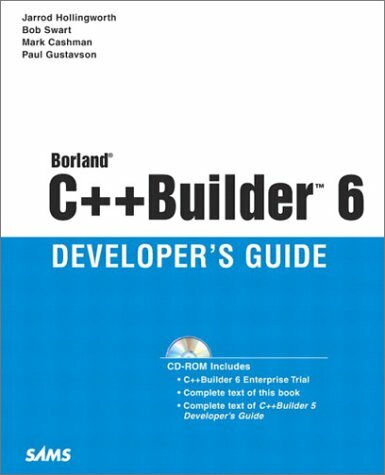 The previous edition (called C++Builder 5 Developer's Guide) will be in PDF-format on the CD with this book. Note that I get a small commission for each on-line Amazon order from my website (so thanks in advance for those of you who wil order). As you can see, I wrote chapters 12 (dbExpress), 13 (XML), 19 (BizSnap: SOAP and Web Services), 20 & 21 (DataSnap), and 22 (WebSnap). Except for chapter 12, those are the only ones that require C++Builder 6 Enterprise (all 18 other chapters are applicable to C++Builder 6 Professional as well). "Welcome to the second edition in the C++Builder Developer’s Guide series. Our goal for this book was to put forth the most informative and practical reference on C++Builder to date. Building on the success of C++Builder 5 Developer’s Guide, we have concentrated on the essential elements and capabilities of C++Builder, including the very latest features provided by C++Builder 6. Topics in this edition include fresh material on XML, SOAP, the Windows API, COM, DLLs, VCL, CLX component development, database development, plus much more including a look at mobile application development. We’ve gone to great lengths to provide practical examples and discussions to common issues, and explore topics not previously covered." This webpage © 2002-2017 by Bob Swart (aka Dr.Bob - www.drbob42.com). All Rights Reserved.